shakesbear, originally uploaded by jahansell. 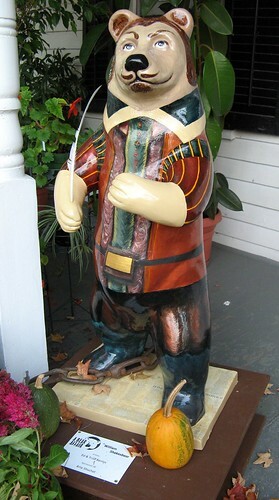 Rick from the wine shop told me a neat story about this bear tonight. It's across the street from the shopping center where his store is, on the front porch of Amy Schuchat's law office. He says people drive up there every day, following the "bear trail" and take photos. Yesterday (the same day I took this picture)O a woman drove up, unloaded a severaly handicapped child from her van, and took his picture next to eh bear, and then they went off to find another bear. It so happens that, at a meeting I was at tonight, a woman complained bitterly about these "ugly plastic bears" - she wants to complain to the organizer, I guess for littering the landscape. (By the way they are temporary.) I just don't understand why. I think they are whimsical, charming, and bring art to the public realm in a very accessible way. And they provide people (not everyone, obviously!) with pleasure!